Carbon capture and storage (CCS) involves capturing carbon dioxide (CO2) emitted from large sources such as fossil fuel power stations, transporting it, and then storing it in secure geological formations deep underground. These formations include depleted oil and gas fields, and natural underground reservoirs. 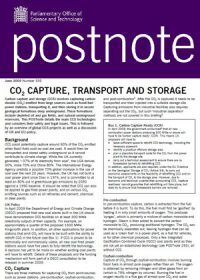 This POSTnote details the main CCS technologies and considers their safety and legal issues. This is followed by an overview of global CCS projects as well as a discussion of UK and EU policy.